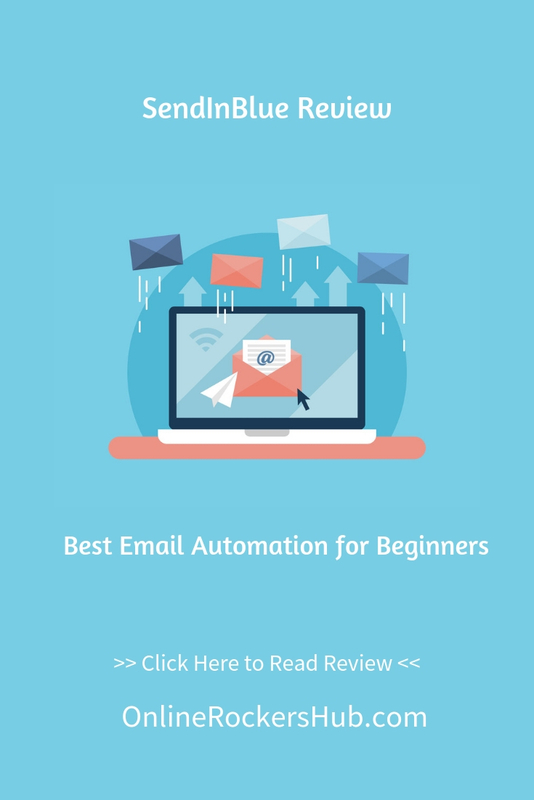 When you are at the beginning of your blogging career or learning to market online, you will find a tough time to find the right email marketing service. No email marketing service is completely free. And the ones which offer email marketing completely free (like open source) lacks many advanced features. SendInBlue is one email marketing service, which I found suitable for my site and right now, I am using it for OnlineRockersHub. How to create a Free account at SendInBlue? 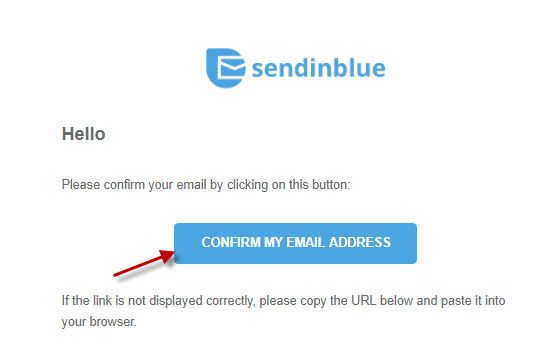 How to validate your account at SendInBlue? Note: This SendInBlue review was originally published on November 10, 2017, and was last updated on March 20, 2019, with the latest updates. 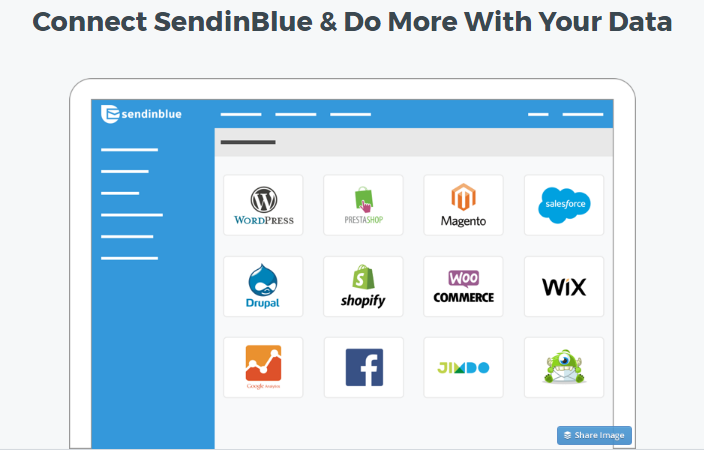 What are the features of SendInBlue? How to Signup for SendInBlue? 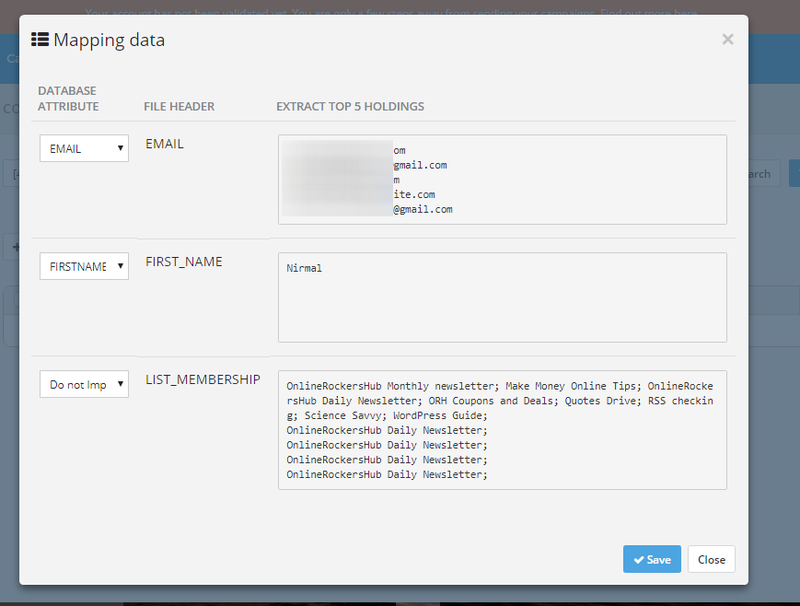 How to create an Email List in SendInBlue? 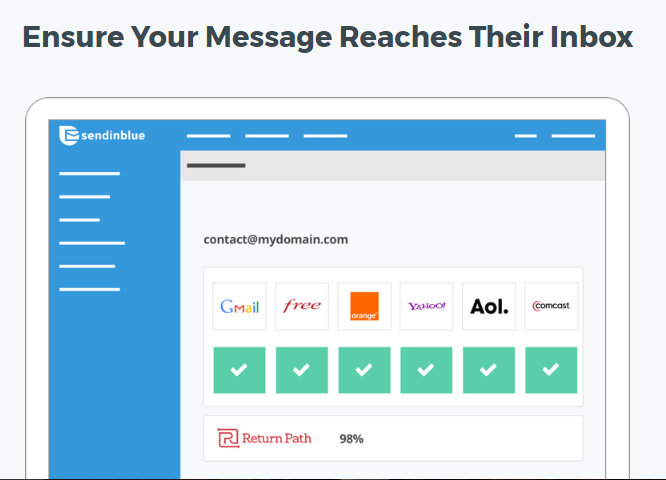 How to send an Email Campaign in SendInBlue? 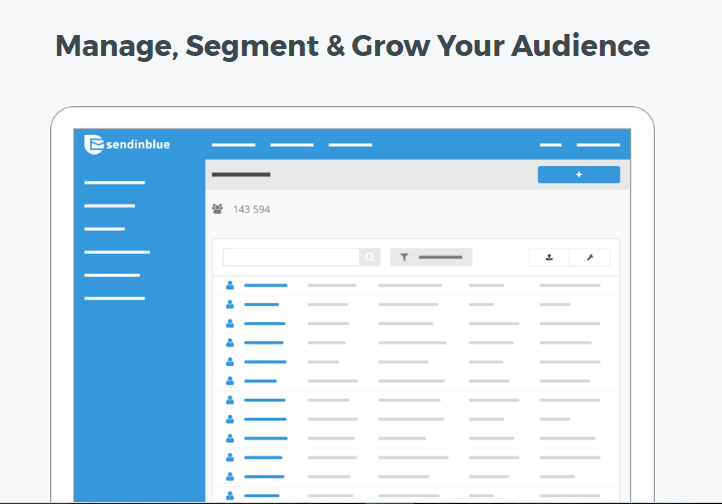 SendInBlue has some attractive features like Drag and Drop Email Designer, Segmenting contacts, advanced Campaign reporting, transactional reporting etc. SendInBlue has a Drag and Drop email designer. So, you don’t need to be an HTML expert to design colorful and attractive email designs. Also, you can preview your email designs for various devices like smartphones, tablet, and desktop. This will help you make sure that your email design is responsive. If you don’t want to put your hands on designing your email campaign, you can always choose one from the templates that are already available. Also, you can create new templates and use them whenever you create a new campaign. Maintaining a bulk list of email addresses can be a tough task. But SendInBlue, will help you manage it with ease, with its smart features. Its advanced search and segmenting option will help you sort the contacts. These lists are dynamic. Therefore it will update automatically, reducing your manual works. The best feature in SendInBlue is that they allow you to upload unlimited contacts and contacts data regardless of whatever plan you are using. 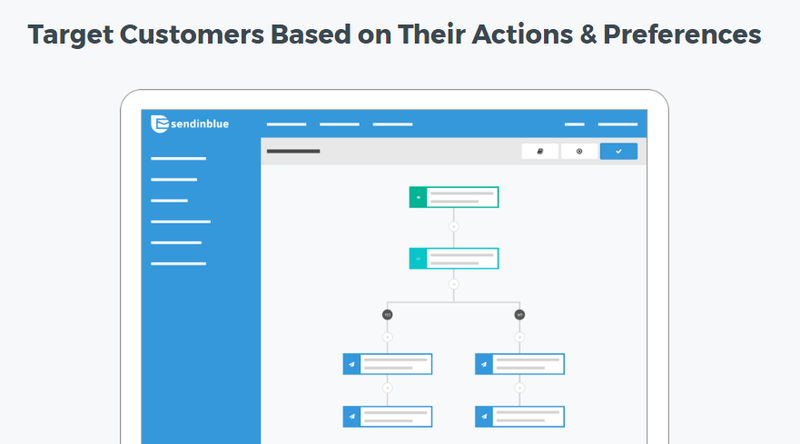 You can even create attractive forms with SendInBlue that will help you capture leads and build your email lists. 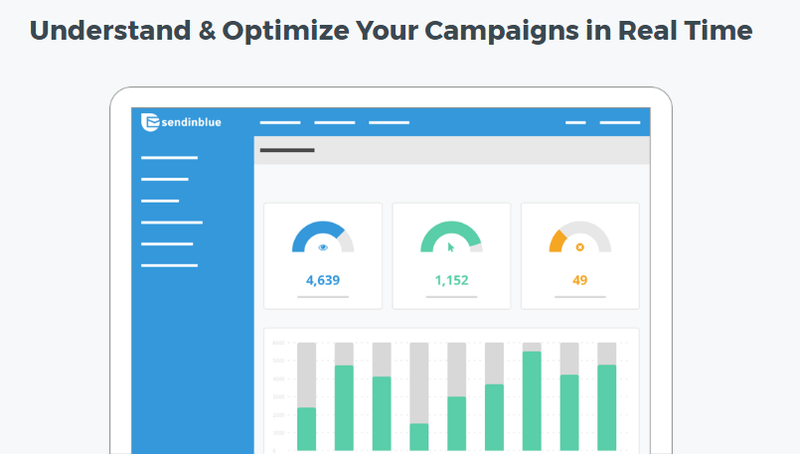 SendInBlue has some attractive campaign reporting system that will help you analyze your campaign performance and optimize your campaigns. By analyzing these reports properly, you can understand what your readers love, what they don’t like, which links they will click, when they unsubscribe etc. The reporting system is just not limited to its features. They display these reports in real-time, which most of the email marketing services lack. You can also export these reports as PDF and CSV. If you are tired of watching results in tabular columns, then you must try out SendInBlue’s engagement map. These maps will offer you the best geographic insights. 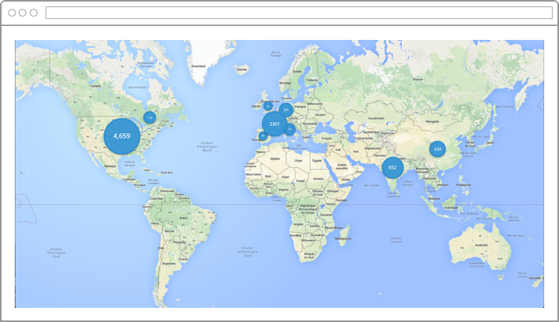 The clickers engagement map will help you identify, geographic interest on your links. 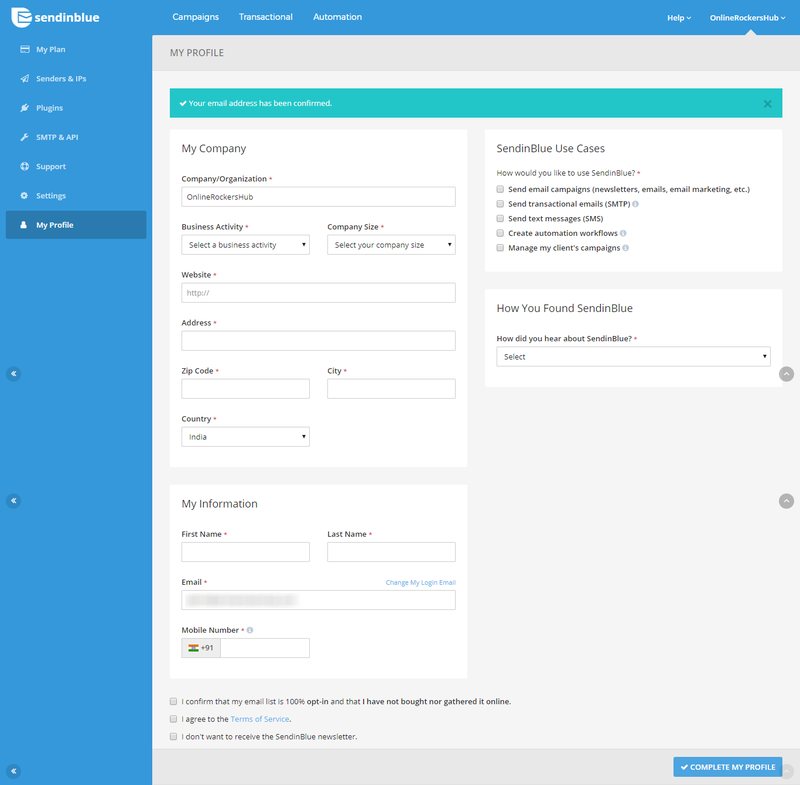 With this marketing automation feature, you can decide actions based on user responses, like when you want to send transactional messages, birthday wishes etc. 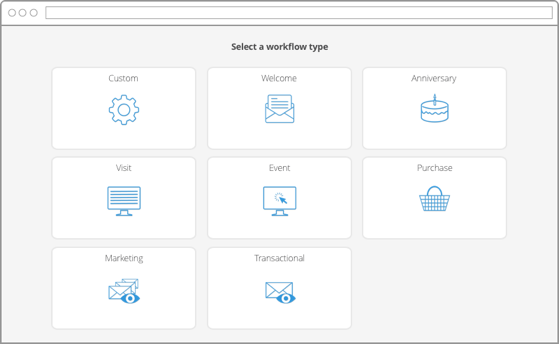 You can choose the workflow for your automation, create unlimited variables and reach your audience at the right time with email or SMS. By creating proper automation funnels, you can boost your Business revenue. As I already mentioned, you can send transactional emails / SMS. You can easily connect SMTP servers with your SendInBlue account. Their flexible APIs will help you create custom and dynamic messages. Many marketers have a doubt if their emails reach their audience or not. Even if they reach, they wonder, whether those emails reach mail folder or spam folder. This is because, when you send unwanted emails, people usually mark your emails as spam. Thus your reputation gets spoiled. By reputation I mean the server and IP address from which you send the mail gets marked as spam. SendInBlue offers you shared & Dedicated IP options at a flexible price. You can use some easy-to-use tools available at SendInBlue to monitor your IP address reputation. You can even use security protocols like SPK, DKIM and DMARC and a dedicated IP address to securely sign emails. This will give you complete control of the IP address reputation. There are a lot of marketing tools available online that can connect with SendInBlue, like WordPress, Facebook, Google Analytics, OptinMonster etc. Read Here: How to use Abandoned Cart Email Strategy with OptinMonster and SendInBlue to increase revenue? SendInBlue has very good customer support. They don’t have a live chat feature, but still got a clear reply with proper instructions. When I had no idea what does the blacklisted emails meant and what should I do with them, I just sent them a message. I got my query replied on the same day. You can check the screenshot below. 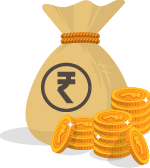 You can check the pricing of Email packages available at SendInBlue. You can check the comparison of these various features here. To get started with SendInBlue, just follow these steps. Step 1: Visit SendInBlue Homepage. And click on “Signup for Free” button. 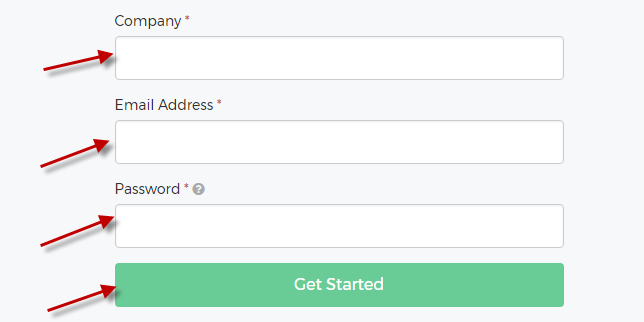 Step 2: In the SendInBlue Registration page, Enter your Company Name, Email Address, and Password. If you don’t represent a company, just enter your name instead of a Company name. And then click “Get Started” button. Step 3: Now, you will have to verify your SendInBlue account. You would have received a confirmation email to the Email address you mentioned in the form. Open the Confirmation Email and click “Confirm my Email Address“. Now, your email address is successfully verified and you have received access to SendInBlue Dashboard. The first thing you have to do in your SendInBlue account is to complete your profile. Do not worry about the account validation notification you see on the header. Your account will be successfully validated once you send an Email campaign. But, in order to send an Email Campaign, you need to first create an email list and add your email subscribers. To create an Email List, go to the Campaigns section and choose Lists menu in your Sidebar. Here you will find the Email Lists available for your account. Click “Add a new List“. Enter the name of your List and then choose the way you want to add your Email subscribers. You can either Import your email subscribers from a .CSV or .TXT file or add a contact manually or copy and paste all email address at once. In this tutorial, I will show you how to add Email subscribers by importing a file. Choose “Import Files“. In the Import Files window, click “Choose File” to upload your .csv or .txt file. 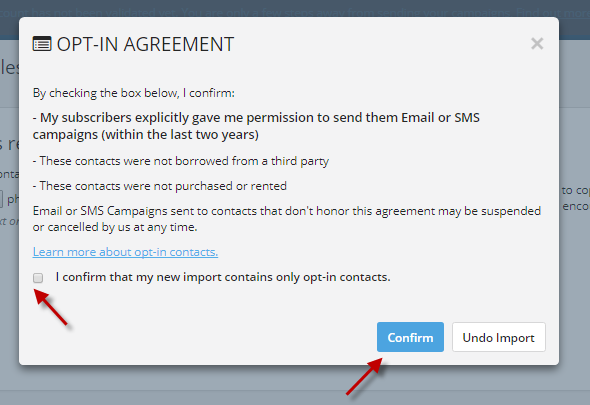 Choose the email list for which you want to import subscribers and then click “Import“. SendInBlue has got an Opt-in Agreement that the email subscribers you import should have explicitly given you permission to send them emails. That means that you should not buy email addresses from third parties. Rather, you should allow them to subscribe to your newsletter. Make sure you have ticked the checkbox and then click “Confirm“. Now, you will have to map the data in your file to the database attributes. Match your columns with the relevant field and then click “Save“. That’s it. You have successfully imported your email list to SendInBlue. The next step to validate your account is to send an Email Campaign. To create a new Email Campaign, go to the Campaigns section and choose My Campaigns menu and then click “Create an Email Campaign“. In the next window, enter the name of the Campaign and give an attractive subject line for your email. Also, choose the From Email and Edit the From Name. The From Name is the Sender Name that your audience will see in their inbox. Once, you have entered these details, click the Next step. In the next step, you will have to choose how you are going to design your email. You can use either use a Drop & Drop Editor or Rich Text Editor or simply paste your HTML code. For this tutorial, I will show how to use the Drag and Drop Editor. 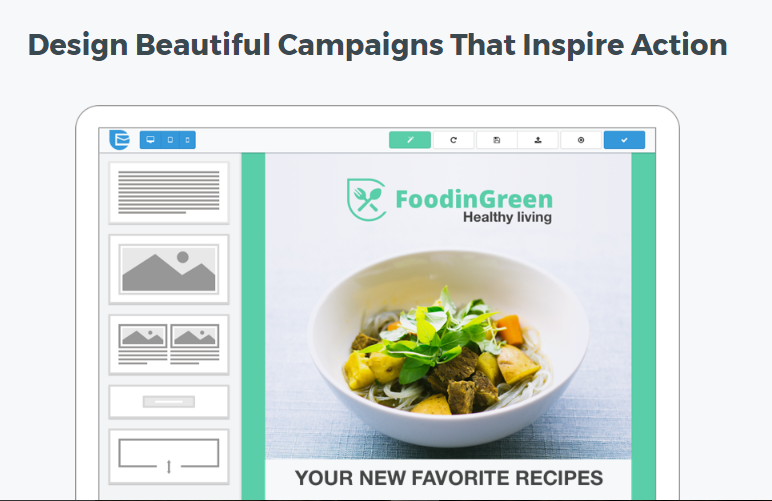 The Drag and Drop Builder comes with templates to cut down your time on creating campaigns. Choose the one which you feel relevant. In case if you don’t like any of these templates, go on with the default one. In the Editor window, the left side is where you can find all the elements to add. The middle area is your actual email campaign. And the right side is where you edit the contents of each element. Once you have done with this, click “Save and Quit“. In the next window, check the preview of your campaign. If you feel, you need to make any changes, edit the email design again. Once, you are satisfied with the design of your campaign, click “Next Step“. Next, you have to choose your audience who will receive this email. 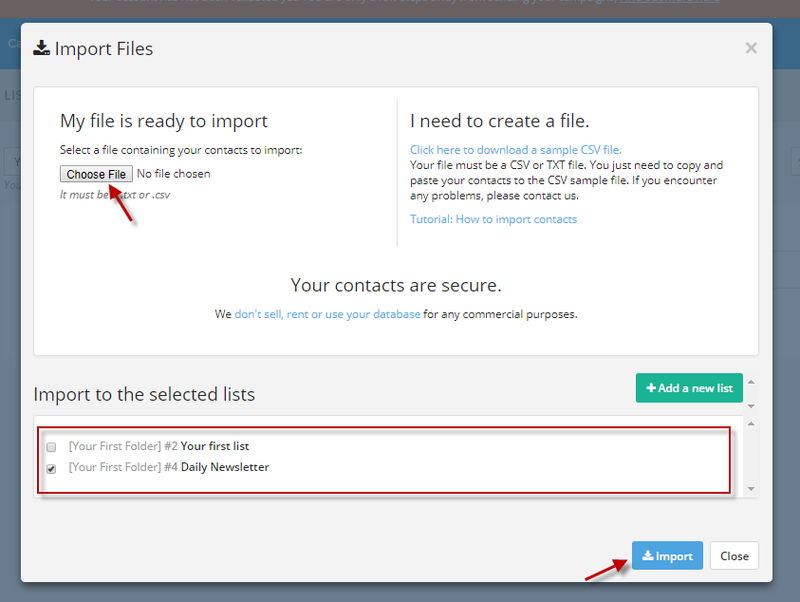 Choose the email list, apply any filters if you need, update the recipient count and then click “Next Step“. In this window, you can cross check everything and then click “Schedule“. 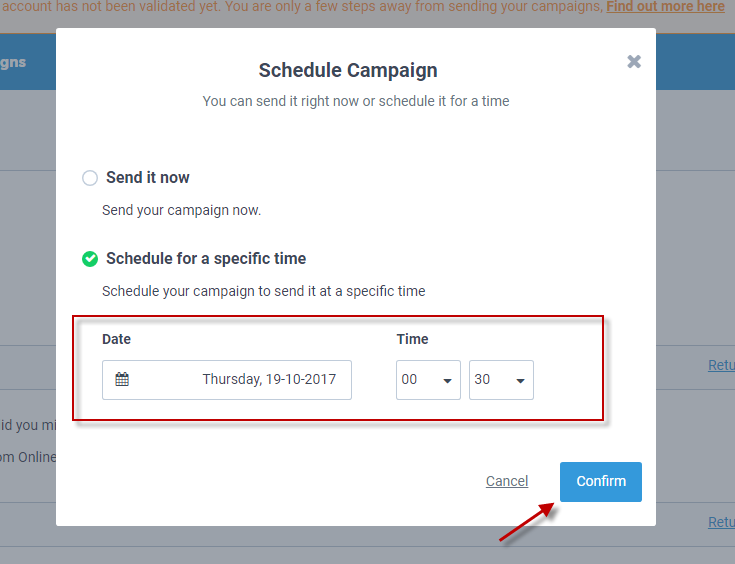 In the popup you get, you can choose whether you want the send the campaign now, or you want to choose the time when you want the campaign to be sent. And you decide the time, click “Confirm“. Since your SendInBlue account has not been validated yet, the first campaign will be sent only after the approval from SendInBlue Review Team. Once, you have successfully cleared the review, you won’t face this waiting time again. That’s how you create a Campaign in SendInBlue. 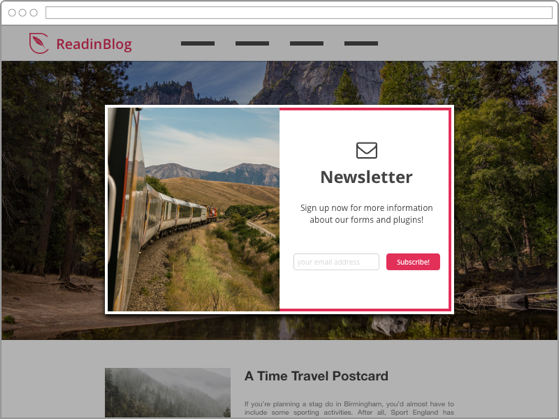 Here is a sample newsletter that I have created with SendInBlue. As I mentioned earlier, I found SendInBlue’s pricing and features very much comfortable. I am able to reuse my templates, time-saving. The list management is the best here. I am able to track instantly who opened, who clicked. Also, the system segregated the blacklist contacts instantly on the first campaign itself. I have connected my Bloom with SendInBlue so that all emails collected through my Bloom will directly go into my SendInBlue list. I am very satisfied with SendInBlue. This is concerned with the Automation feature of SendInBlue. Though the workflow allows conditional logic, it is not yet possible to combine multiple conditions. This is leading to a lot more complexity. I hope, SendInBlue comes up with a solution for this as soon as possible. And the next one is automatic detection of First Name. In order to simplify the process of attracting more leads, we collect only email addresses. But, often while sending email campaigns we need the First name to address the audience. A feature to automatically detect the First Name will be a lot more helpful. 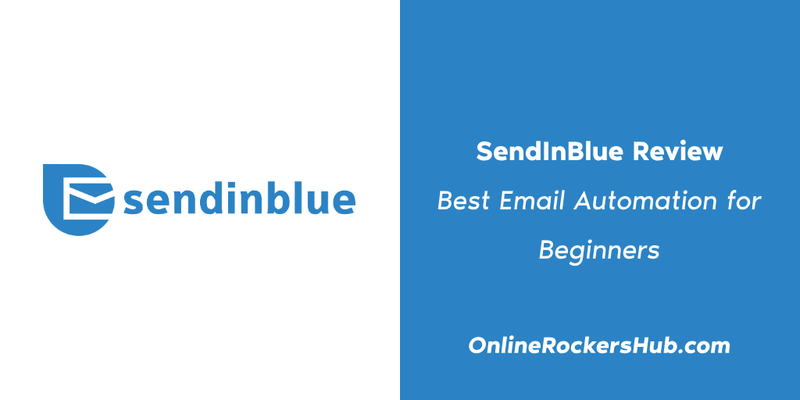 SendInBlue is an introduction to advanced email marketing for beginners. Simple Interface with flexible pricing and easy-to-use list management tools. So, if you are a beginner and interested in exploring more automation features, SendInBlue is the right choice. Which email marketing service do you use? Or you satisfied with its performance? Let me know in the comments section. If you like my review on SendInBlue, pin this. Very іnteresting info!Perfect just what І was sеarching for! Great to see that found what you want. Some truly superb conten on this site, thankүou for contribution.